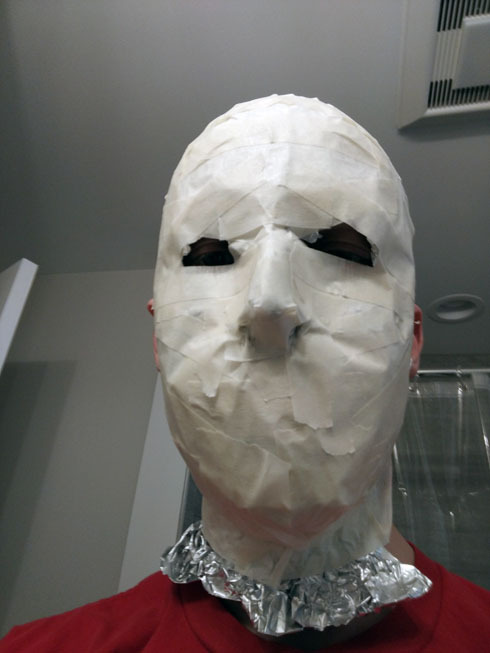 The gist of the process is you cover your face in aluminum foil, then fully cover it in layers of masking tape. 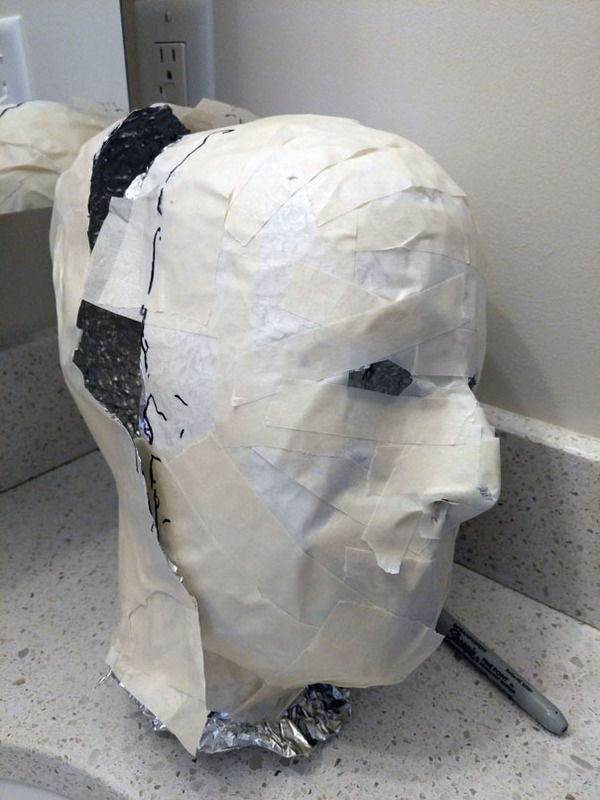 The two halves are crafted separately and then rejoined after taking some measurements of your own head. By the way, if you need to measure your head, I found that a speed clamp works pretty well. It’s like a giant, less precise pair of calipers that you can clamp over your noggin, then measure with a ruler. Once you have your measurements, you cut some cardboard supports to glue inside and then recombine the halves. Once that’s good, you need to pack it with a filler. 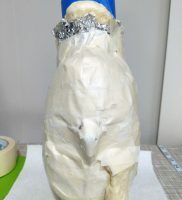 Dali uses a mixture of broken up Styrofoam bits and PVA (Elmer’s) glue. 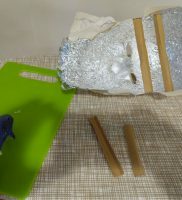 Pack the head, insert some support rods, mount it on something stable, and let it dry. 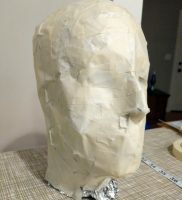 The mannequin is further reinforced by covering it in strips of paper towel soaked in Elmer’s. 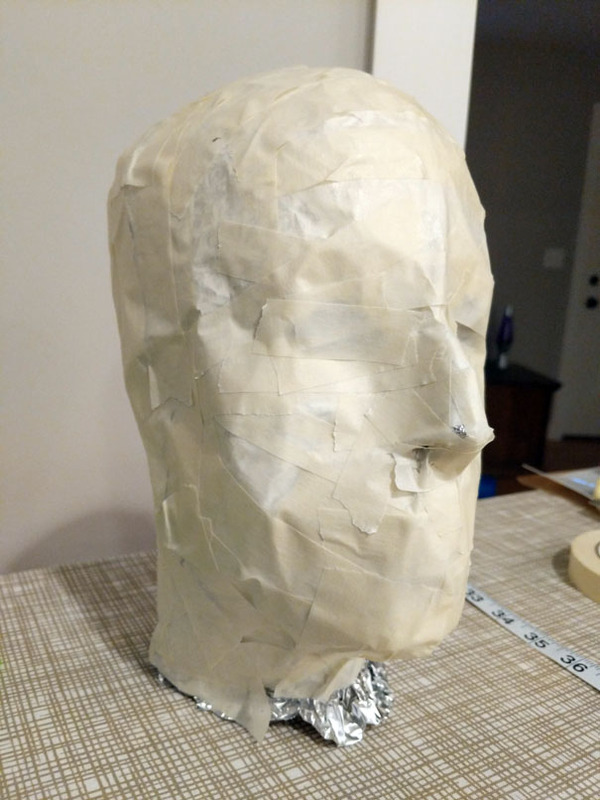 It’s rough and sloppy, but uses materials most of us have hanging around so it’s pretty cheap to try. And for making a bulky Pokemon head, rough should be good enough. 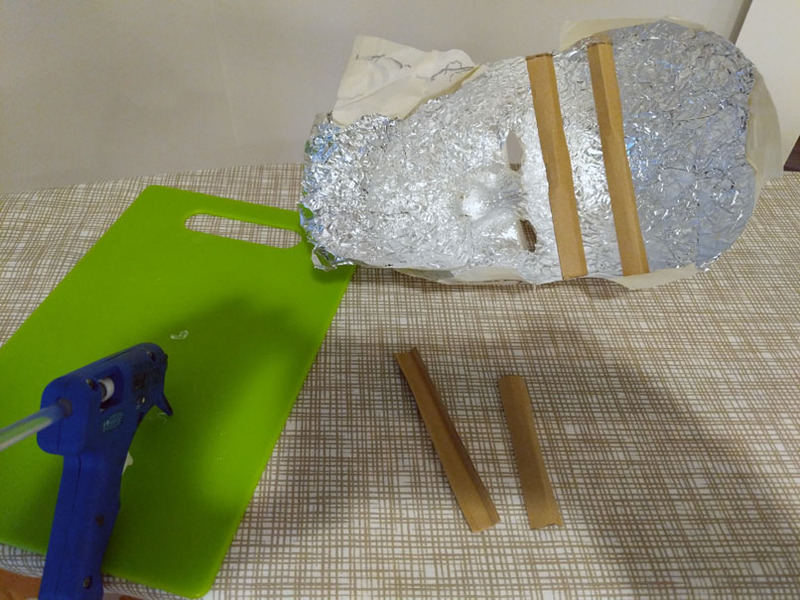 I started the process and it was going pretty well up through recombining the foil/tape halves with supports. 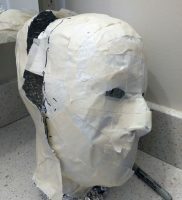 Here’s a few pictures of that process. But then I decided to change the script. I don’t have any styrofoam hanging around — I try to get rid of that stuff as fast as possible. And I don’t think I have enough glue either. 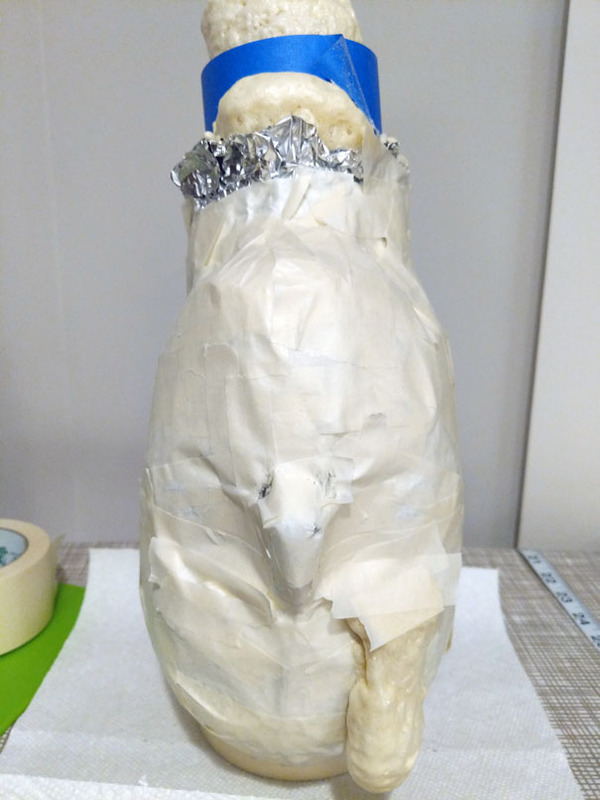 And it looks like a pretty messy and time-consuming process to keep mixing up the foam and glue and stuff and pack that head mold. So what else do I have on hand that looks like a good candidate? Expanding spray foam! In theory, I just shake up the can, spray it in the head, and let it expand to fill the cavity. 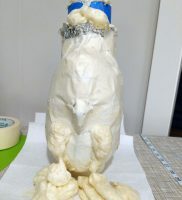 All the excess foam can bubble and push its way out of the neck hole, and I’ll saw it off later. Oh … oh god … what is going on … no … stop … aaaaaagh. 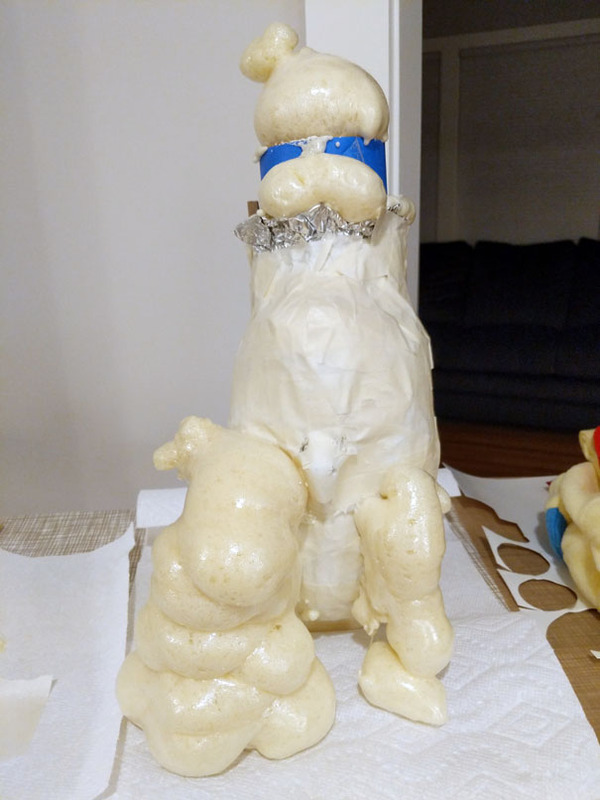 Well my first mistake was underestimating how much the foam would expand from its initial volume. 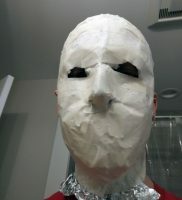 It didn’t take long for the foam to break through the meager strips of tape covering my eye holes, oozing out and hardening in a foamy reenactment of the Chernobyl elephant’s foot. This went on for hours, and when it finally stopped and I cut off one of these eye pillars, the foam just started oozing again. 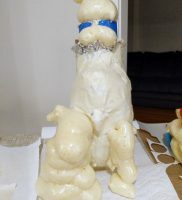 And this gets to the second and more fundamental mistake: expanding spray foam is not suitable for an enclosed cavity. Like a foil-lined head mold. Spray foam needs to react with moisture in air to expand and cure. With no source of moisture, it will remain in its frothy, volatile, semi-liquid state. Potentially forever. And after a day of letting this thing sit, the head readily caved in to even light pressure applied. 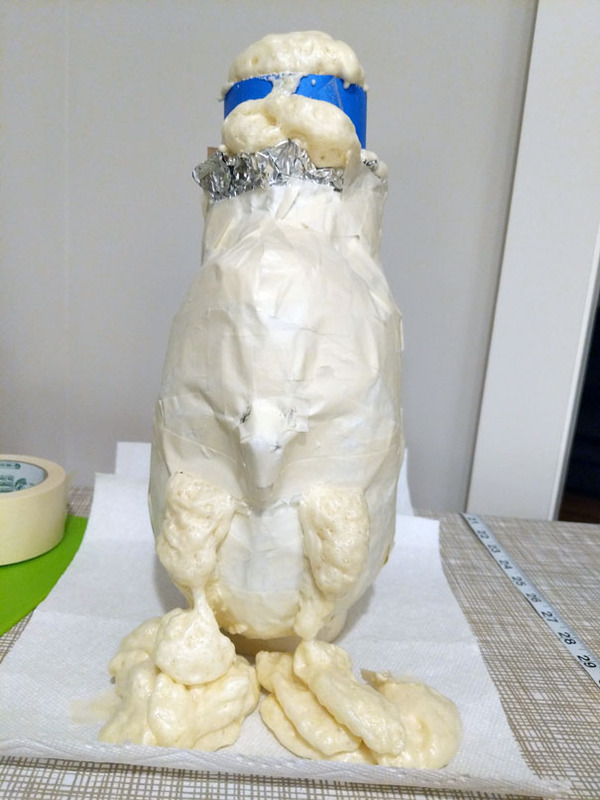 The foam wasn’t curing, and now I have this nasty horror show of elephant-foot-face sitting on my counter. If you’re working on a project and learning as you go, I don’t think it’s a bad thing to try and go off script. You might discover something cool. But maybe reconsider if you’re on a tight deadline. It might just melt down in front of you and you’ll have to start over from scratch.